At least once a week at my house, we eat a salad for dinner. It's great way to use up any leftover meat or lonely vegetables that might otherwise be forgotten in the drawer of the refrigerator. It's also easy to customize for picky eaters. 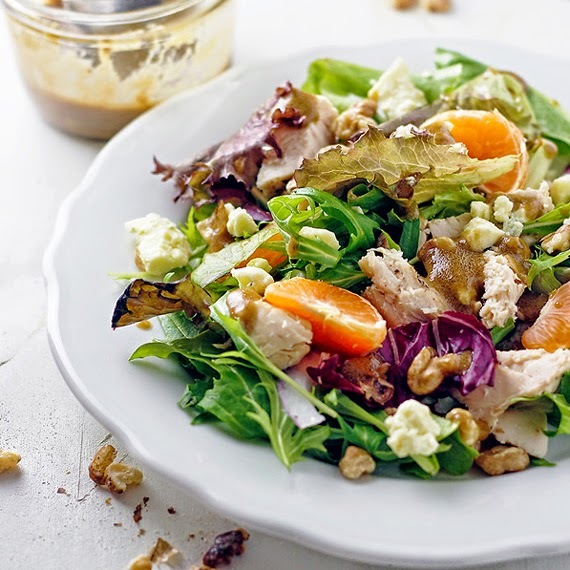 I love this salad because the saltiness of the blue cheese pairs well with the sweetness of the oranges. It's packed with protein and vitamin C (which is vital for the immune system during cold and flu season!). It's also filling and completely satisfying (words people forget can describe salad). Have leftovers? Chicken and Orange Salad makes an amazing wrap for lunch. *Creative Green Living recommends purchasing these ingredients as organic where available to avoid GMOs, pervasive pesticides and unsustainable farming practices. Nutrition information is approximate and may vary based on the freshness and brand of your ingredients. Nutrition information calculated at: Calorie Count based on the recipe making four servings. Season and grill chicken until internal temperature reaches 165 degrees, cut into bite sized cubes. Toast walnuts (either in a 350 degree oven, toast on a cookie sheet for 10 minutes, or toast in a dry cast iron skillet), then give them a rough chop. 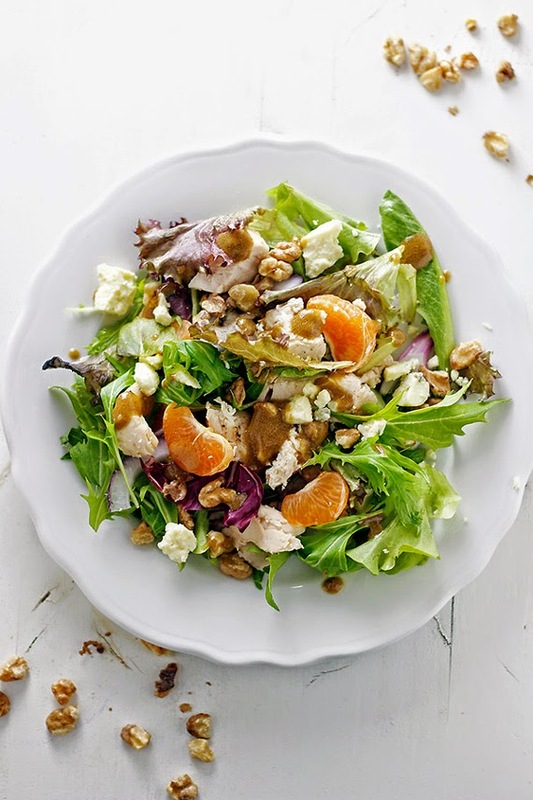 In a large salad bowl, toss together lettuce mix, onion, oranges, chicken, walnuts, and blue cheese. Make dressing: whisk together mustard, garlic, balsamic vinegar, salt and pepper (to taste). Drizzle in olive oil while whisking to emulsify (you're looking for a creamy consistency). 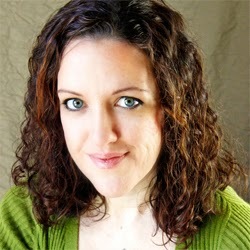 Amber Gaines is a food and craft blogger that lives in Tennessee with her husband and 3 kids. You can see more of her delicious recipes at Sew...Let's Cook or check out what she's sharing on Pinterest, Facebook, or Instagram.